RI General Treasurer Seth Magaziner well understands that what banks and credit unions do is accept money in from depositors and lend it out to borrowers, charging interest from borrowers and paying interest to depositors, and the amount of money they can lend is limited by the amount deposited with them. In a healthy economy, there will always be enough creditworthy borrowers to make use of available credit, so the choke-point of lending will be the limited amount of money to lend. The relationship between those who want to borrow and those who want to lend is a complicated matter of supply and demand, with interest rates rising and falling based upon the mix of potential borrowers. 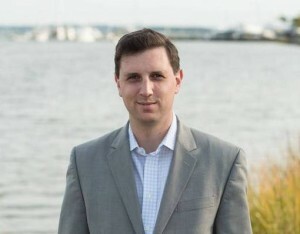 One of the larger depositors in Rhode Island is the state government itself, and Magaziner said that he typically manages between a quarter of a billion and one billion dollars in cash in order to fund its operations, the amount varying because tax and revenue collections tend to happen during a relatively short few months while expenditures occur more evenly throughout the year. The state has to keep its cash safe in banks and credit unions, anyway, so Magaziner and his team realized that they could choose to allocate deposits strategically in order to encourage lending to small businesses with neither cost nor risk to the state. That realization led to the creation of the BankLocal program, where the state makes a deposit to replenish the supply of capital after a qualifying small business loan is made, allowing the bank to make another loan. “When a bank is in the process of working with a small business owner to deliver a loan, they will also contact us, let us know that they have a loan in the pipeline that meets our qualifications, and then as soon as the loan is closed we transfer the cash. Our qualifications include: The loan has to be $250,000 or less, and it has to be to a business of 100 employees or less, that is located in the State of Rhode Island. We want to target this very specifically at small businesses in the state,” Magaziner told Motif. For more information about the BankLocal program, see: treasury.ri.gov/banklocal where small businesses seeking loans can find links to participating financial institutions (currently BankRI, Bristol County Savings Bank, Centreville Bank, Customer’s Bank, Home Loan Investment Bank, Navigant Credit Union, People’s Credit Union, Washington Trust).